On July 4, 2017, about 1430 eastern daylight time, a Luscombe 8A airplane, N45851, was substantially damaged when it impacted terrain while on final approach to runway 9 at Remsen City Airport (NY57), Remsen, New York. The commercial pilot was fatally injured. The airplane was registered to the pilot, who was operating it as a Title 14 Code of Federal Regulations Part 91 personal flight. No flight plan was filed, and visual meteorological conditions prevailed for the local flight that originated at NY57 about 1416. The pilot's girlfriend took a short video of the airplane just after it departed runway 27, a 2,000-ft-long by 100-ft-wide grass runway. As the airplane made a normal climb toward the west, a windsock was visible in the video. The windsock indicated that the wind was out of the northwest about 6 knots. About 14 minutes later, a witness observed the airplane heading east. He saw the airplane make a steep right turn followed by a steep left turn to get lined up on the final approach path for runway 9. The witness said that the airplane straightened out as it descended toward the runway and appeared to be on a normal approach path. The witness could not recall the airplane's ground speed. 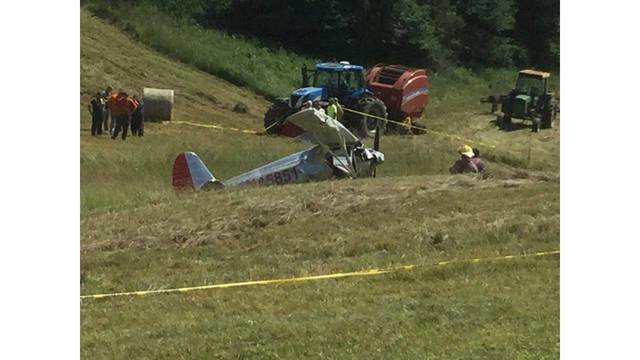 The airplane's wings were level when it suddenly nosed over into a hayfield from about 75 ft above the ground. The witness did not see the airplane rotate as it descended but thought that it probably did because it came to rest heading in the opposite direction of travel. The witness said that the airplane's engine was running normally right up until impact. He did not see or hear anything unusual with the airplane or engine before it nosed over. He added that the weather was "beautiful" that afternoon, and he did not remember it being windy. The pilot held a commercial pilot certificate with ratings for airplane single-engine land and instrument airplane. A review of the pilot's logbook revealed that he had a total flight experience of 1,783 hours of which 13 hours were in the accident airplane. The last entry made before the accident flight was on November 14, 2016, about 8 months before the accident. The flight was in the accident airplane and lasted 0.7 hour, and the remarks stated that the pilot practiced stalls, level flight, and landings. The pilot's last flight review was completed on September 13, 2016. His last Federal Aviation Administration (FAA) third-class medical certificate was issued in March 2017 with a limitation to wear corrective lenses. A review of the airplane's maintenance logbooks revealed that the engine was overhauled in April 2016 after the airplane had been in storage for many years. In September 2016, the airplane underwent an annual inspection before it was sold to the pilot in October 2016. At the time of the accident, the airplane had accrued about 2,897.9 hours, and the engine had accrued about 13 hours since overhaul. A mechanic, who was also a friend of the pilot, stated that he had been working on the airplane since May 2017. On June 26, 2017, he and the pilot installed a new fuel selector valve and checked it for leaks. They also ran the engine for about 15 minutes. The mechanic said that "everything was in proper working order." However, he had not released the airplane back into service since there was outstanding work that needed to be done, which he described as "small stuff." These maintenance items included installing shoulder harnesses and checking the airplane's alignment since the tail traveled "slightly" to the right. At 1453, the weather reported at Griffiss International Airport (RME), Rome, New York, about 12 miles southwest of the accident site, included calm wind, visibility 10 miles, broken clouds at 7,000 ft, overcast clouds at 9,500 ft, temperature 24°C, dewpoint 13°C, and an altimeter setting of 30.01 inches of mercury. NY57 was a privately-owned airport that was closed in November 2016 when the owner of the property died. Large, white, wooden X's were placed at the approach end of each runway. According to the mechanic, the pilot knew the airport was closed, and the wooden X's were visible in the video provided by the girlfriend. 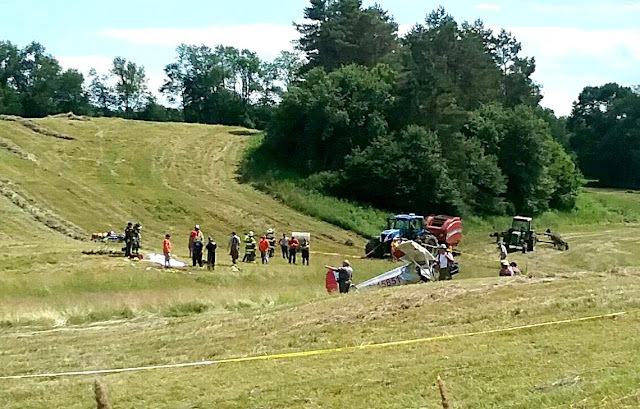 The airplane came to rest upright in a hayfield about 660 ft from the end of runway 9 on a magnetic heading of about 261°. There was no evidence of postimpact fire, and all major components of the airplane were accounted for at the site. A cluster of three ground scars were observed about 10 ft forward and to the right of where the airplane came to rest. The engine remained on the airframe but had been displaced up and to the left from impact. The two-bladed propeller remained secured to the engine. Both wings, the fuselage, and the forward empennage area sustained structural damage. No damage was observed to the tail control surfaces. Flight control continuity for all major flight controls was established to the cockpit. The single fuel tank located behind the front seats was breached, and fuel was observed leaking from the tank. According to NY57 fuel records, the pilot obtained 5 gallons of 100LL fuel on the day of the accident. A sample of 100LL fuel from the fuel farm located at NY57 was absent of water and debris. Shop air was blown from the main fuel line that attached to the fuel tank and ran all the way through to the carburetor. There was a breach in the line just aft of the gascolator, and the glass gascolator was broken from impact. No obstructions were noted in the main fuel line. An examination and test-run of the engine was conducted on October 18, 2017. The engine sustained some impact damage, and the left magneto was partially separated from the engine. The oil pan was also partially separated at its attachment point. The engine was prepped for the test-run by removing and replacing the broken left magneto and the oil sump. The engine started and ran through its entire power range without interruption. No mechanical anomalies were noted that would have precluded normal operation of the engine at the time of the accident. The Medical Examiner's Office - Onondaga County Health Department Center for Forensic Sciences, Syracuse, New York, conducted an autopsy of the pilot. The cause of death was determined to be multiple blunt force injuries. The FAA's Bioaeronautical Sciences Research Laboratory, Oklahoma City, Oklahoma, performed toxicological testing of the pilot. Fluid and tissue specimens from the pilot tested negative for carbon monoxide and ethanol. Atropine and etomidate were detected in blood from the heart. These drugs were most likely administered by medical personnel providing emergency care after the accident. The airplane was equipped with lap belts only. According to law enforcement personnel who responded to the scene, the pilot was wearing his lap belt, and paramedics unclasped the belt upon their arrival. Examination of both sides of the belt revealed they were securely fastened to the floor structure, and the buckle worked as designed. No mechanical issues were found with the lap belt. The airplane was not equipped with shoulder harnesses; however, the pilot's mechanic stated that the pilot had purchased two lap belt/shoulder harness assemblies to be installed in the airplane. The assemblies were part of a supplemental type certificate (STC), but the mechanic could not recall who owned the STC or where the harnesses were purchased. A search of STCs for the Luscombe 8A airplane revealed there was an STC (SA01092WI) for a "3-point Lap Belt- Shoulder Harness Restraint System Installation using an inertial reel." The FAA published Seat Belts and Shoulder Harnesses, Smart Protection for Small Airplanes (AM-400-90/2). In the publication it states that if an airplane was manufactured without shoulder harnesses, the owner should obtain a kit to install them from the manufacturer or manufacturer's local representative. In addition, the publication notes that seat belts alone will only protect the occupant in very minor impacts and that using shoulder harnesses in small aircraft would reduce injuries by 88 percent and fatalities by 20 percent.